Maria-Jose Vinas | NASA Jul 25, 2017. IceBridge’s main instrument, the Airborne Topographic Mapper laser altimeter, was recently upgraded to transmit 10,000 pulses every second, over three times more than the previous laser versions and with a shorter pulse than previous generations. The upgrade will allow the mission to measure ice elevation more precisely as well as try out new uses on land ice. 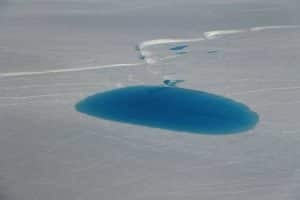 During this campaign, IceBridge researchers want to experiment whether the laser is able to measure the depth of the aquamarine lakes of melt water that form on the surface of the Greenland Ice Sheet in the summer. Large meltwater lakes are visible from space, but depth estimates from satellite imagery — and thus the volume of water they contain— have large uncertainties. Those depth estimates are key to calculating how much ice melts on Greenland’s ice sheet surface during the summer.